Calling all lads and lasses - it’s time to get your green on and let your inner leprechaun out to party! Discover the pot of gold at the end of the rainbow at one of the largest outdoor St. Patrick's Day parties on the West Coast when the 23rd annual ShamROCK Festival returns to take over the streets of San Diego's Gaslamp District on Friday, March 17, from 6pm to midnight, featuring live performances by MIMS, Black Irish Texas, Styles & Complete and many more. In addition to offering promo code SDVILLE for $5 savings on GA tickets and $10 on VIP, we are also raffling off 2 VIP passes to attend! San Diego ShamROCK is celebrating its 23rd year as San Diego's biggest Saint Patrick's Day bash where over 20,000 attendees from across the U.S. flock to downtown each year to party on green carpeted streets, throw back Irish libations (Sláinte! ), and jig into the wee hours of the night to Irish punk, rock, and bass heavy beats across three stages. Top it off with the hottest plaid-clad go-go dancers in town and award winning traditional Irish steppers and you have a recipe for the perfect Saint Patrick's Day celebration. Grab your friends, don your green attire, and head to the Gaslamp Quarter to experience firsthand the Emerald Isle of the West Coast at ShamROCK. Tickets to this event are $50 for General Admission passes. 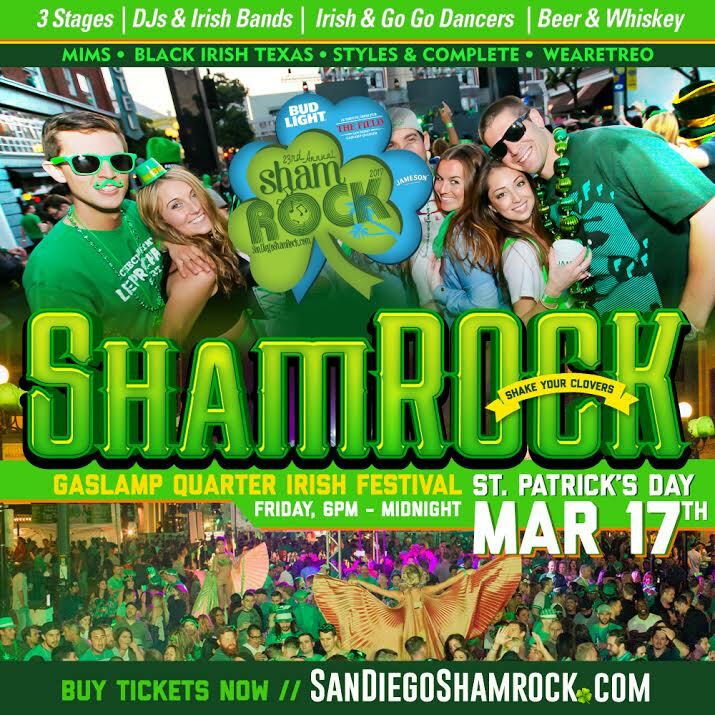 Shake your ShamROCKs in style and go VIP, starting at $110, which includes VIP entry, 3 complimentary drinks inside the venue, 3 complimentary drinks at participating Gaslamp bars, $1 off drinks at the VIP Lounge Bar, access to the Exclusive VIP Lounge, VIP Restrooms, and more. Promo code SDVILLE saves $5 on GA tickets and $10 on VIP when purchased online. 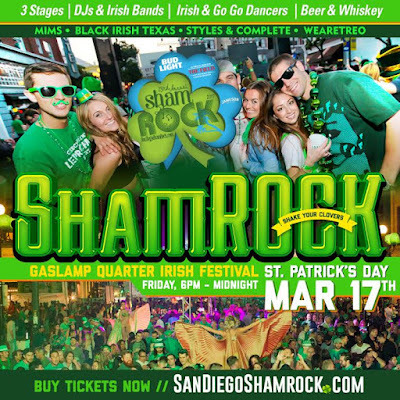 San Diego shamROCK is produced by and benefits the Gaslamp Quarter Historical Foundation which focuses on the development and preservation of Downtown San Diego. For more information or to purchase tickets, visit sandiegoshamrock.com.